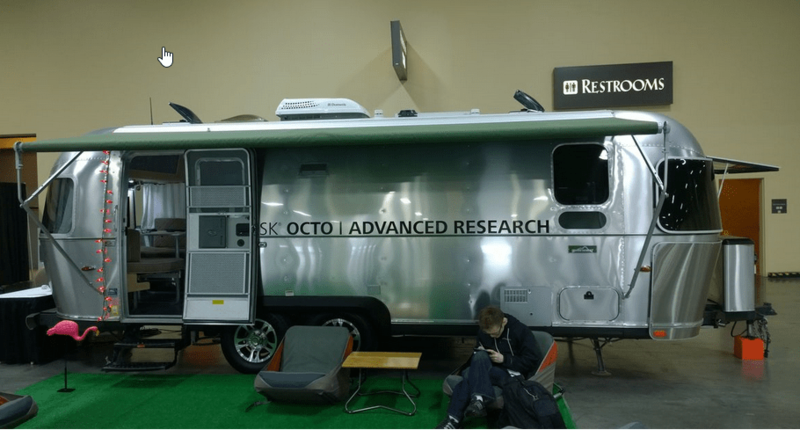 Back when I attended Autodesk University in 2016, I had the opportunity to have a discussion (in the famous Airstream trailer) with some Autodesk representatives regarding a new interface Autodesk was developing. That session ended up being my first introduction into Generative Design. Although the concept of Generative Design has now been around for a few years, it’s becoming more of a prevalent topic these days. Generative Design is possible through a paid subscription or a subscription that entitles you access to the Fusion 360 Ultimate product. 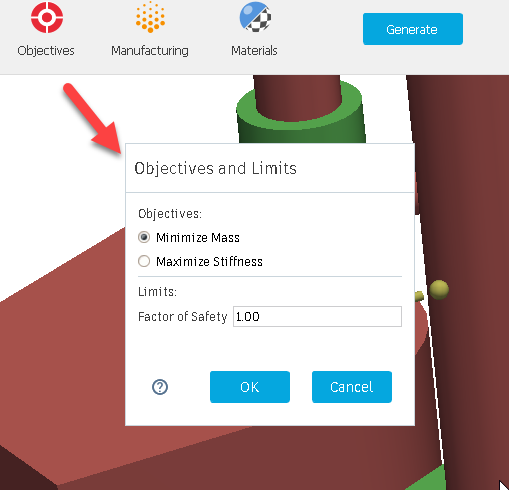 It is still a separate application that you can only download through your Fusion 360 Ultimate interface. 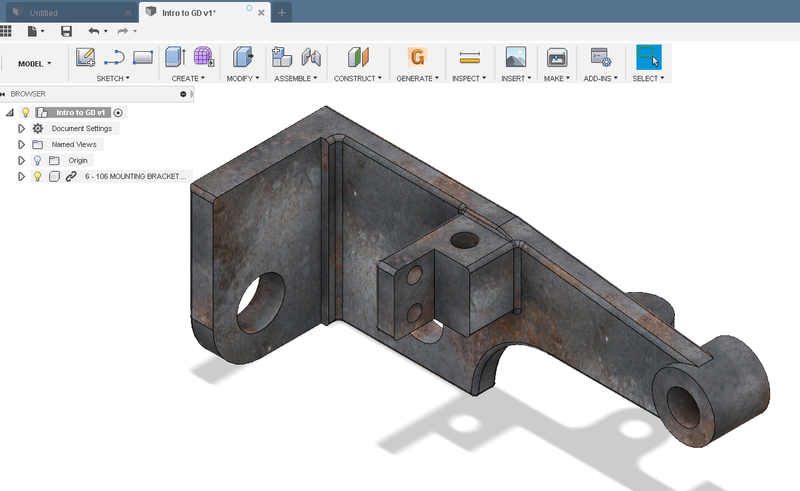 As of Oct 7, 2018, Autodesk is combining Fusion 360 (standard) and Fusion 360 Ultimate into a single package and thus, current/future Fusion 360 users will have access to Generative Design. If you would like additional info about this new offering, please reach out to your Synergis Account representative. 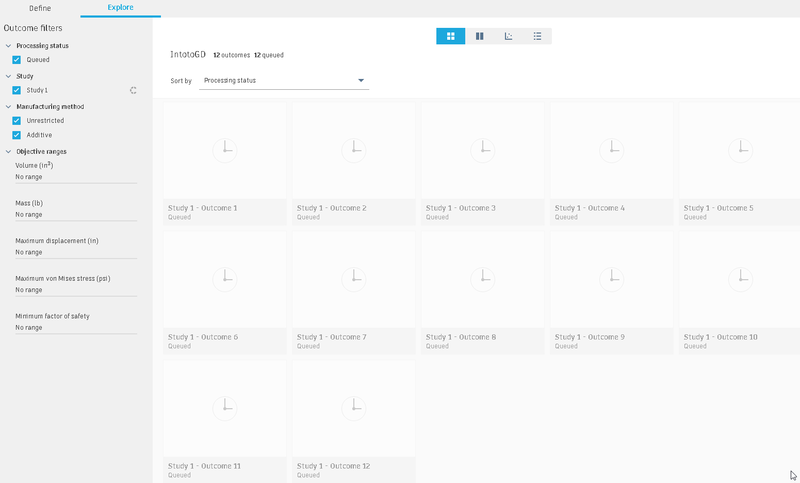 The actual studies are performed, maintained, and stored within the Autodesk Cloud. End user must have an Internet connection and the ability to work with/store their designs/outcomes outside of their company’s infrastructure. 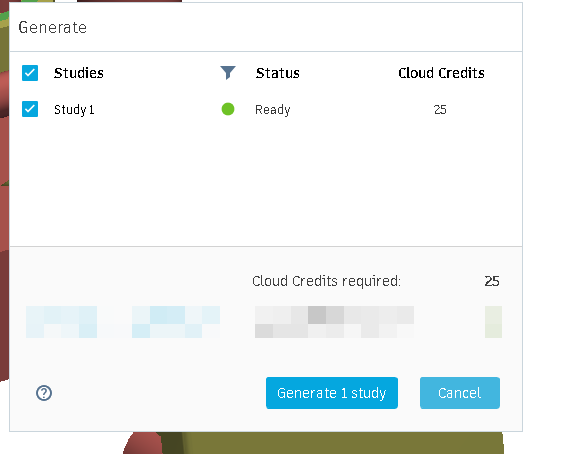 In order to start a study, 25 Cloud credits must be available for that given user. At the time of this article, I’m not 100% sure if every study will consume that exact amount and/or how it will be handled in the future regarding these credits. Cloud credits that are removed from your account to start the study will be returned if a given study is unable to generate any outcomes. From my perspective, the interface seems straight forward. Basically, you work from left to right in the application’s toolbar and provide the information for each function. Final thought: In the beginning I was trying to use Generative Design as though I was setting up an individual part in Autodesk Inventor or Fusion 360. 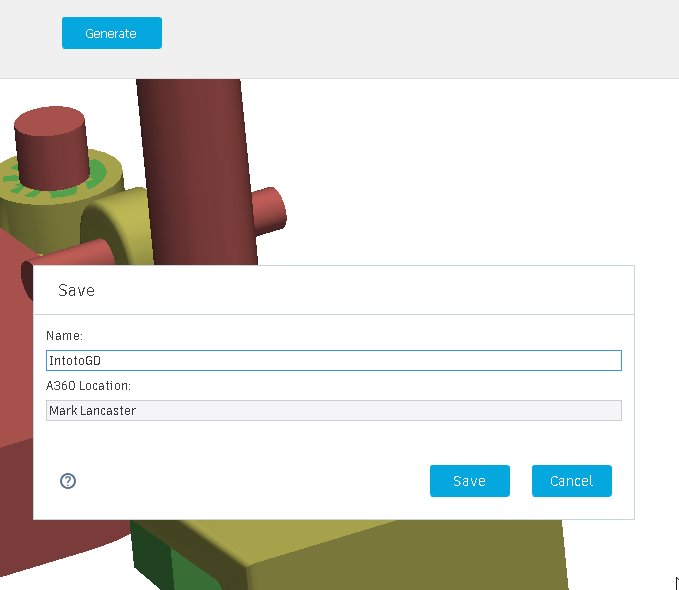 With Generative Design, not only do you think about your overall component design, you also have to consider the “design space” that encompasses your component, much like an assembly within Inventor. In order to provide the correct outcome/solution, you must include those items or a representation of such items that would impact your design space. We will discuss this shortly. 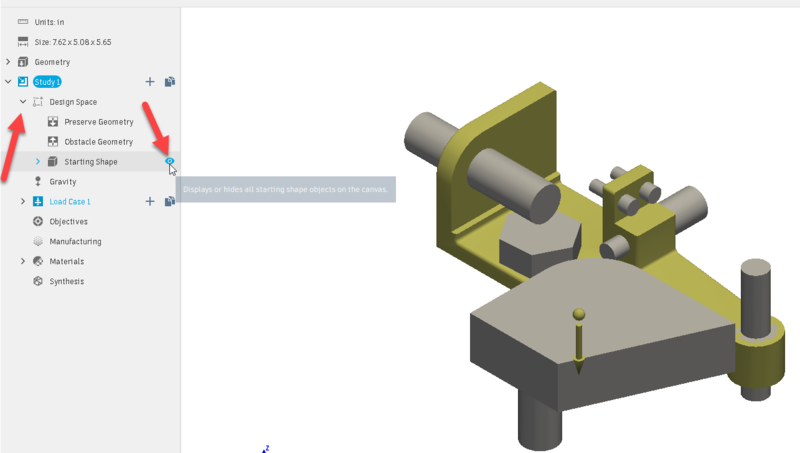 For this, I’m using Fusion 360 and importing a bracket from GRABCAD as my starting point. 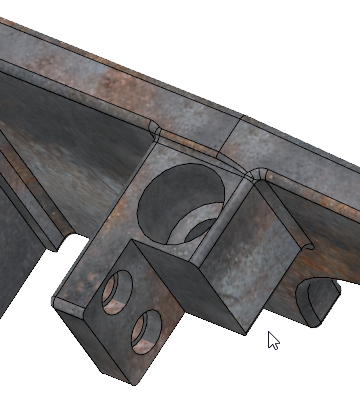 Next step is to define the design space around the bracket. There are 3 types; preserve, obstacle, and starting shape. 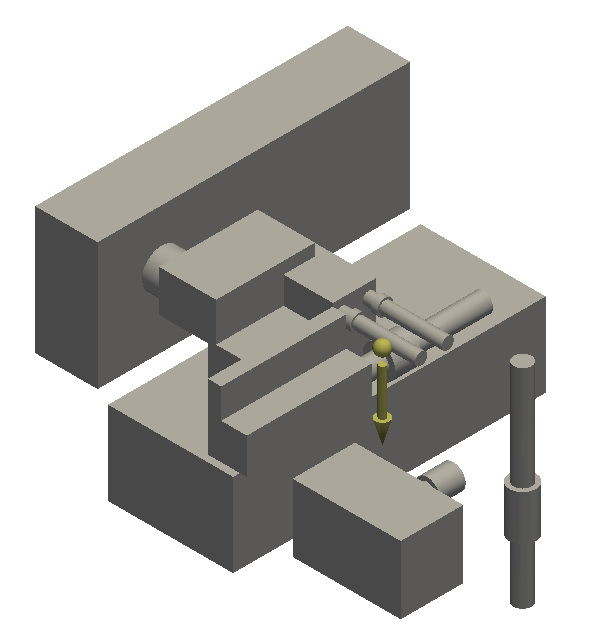 This type of design space instructs the application that you’re not permitted to vary from that given shape/geometry, even if the same shape criteria is already part of the starting shape. 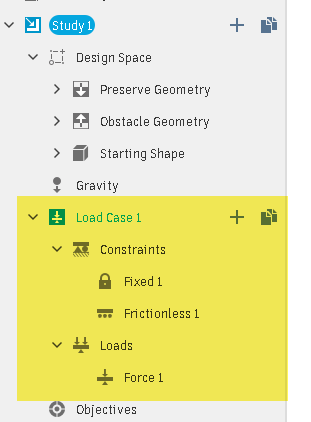 Also the “preserve” selected geometry defines the loads and constraints associated to the case study. It simply means don’t put any material in that given designated area when solving for outcomes. 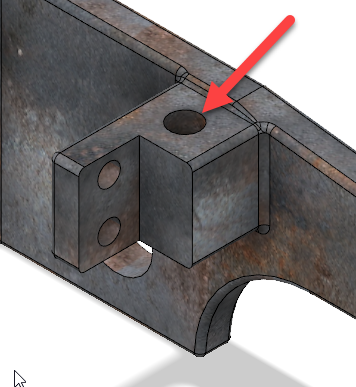 For example, let’s say this hole (in the image below) is an access point allowing a screwdriver or some other form of tool to reach through our bracket and tighten the hardware that’s located below it. This means we would have to create a separate void to represent that “obstacle.” Outside of that obstacle, Generative Design can work around it, as needed. In some cases, the surrounding design criteria may be overlapping/interfering and thus it would be considered both preserve and obstacle. When that occurs, you must create separate geometry representing those design space requirements. This criteria indicates the state you started with. In most cases, this is going to be the actual design you created in the designated CAD application. 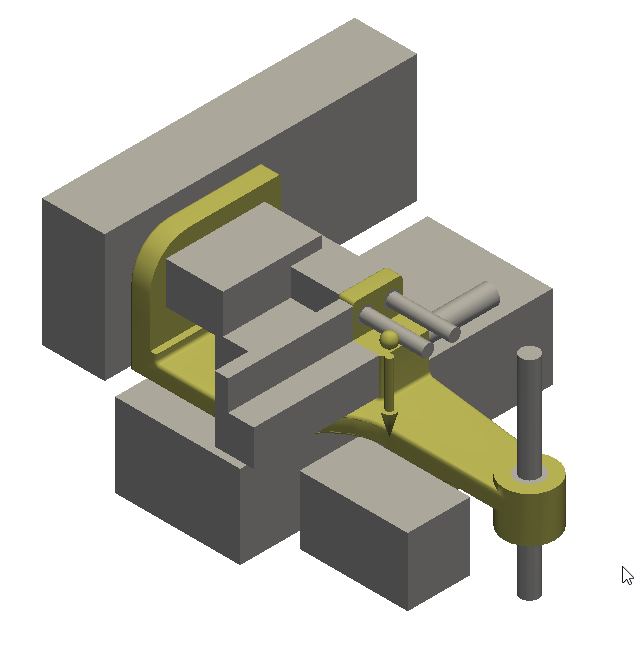 In my example, it’s the mounting bracket I imported into Fusion 360. To add more criteria for this Generative Design study, I’ll update the existing design of the hole I indicated above and the two smaller holes left of it. I will change the thru holes over to a counter-bore type of mounting hole. Now let’s start defining the actual design criteria around the mounting bracket. To make things clearer, I’ll being using a color red to represent the obstacle criteria and green for the preserve information. These two (2) colors coincide with the coloring scheme within Generative Design and will make it easier to understand as we progress through the tutorial. 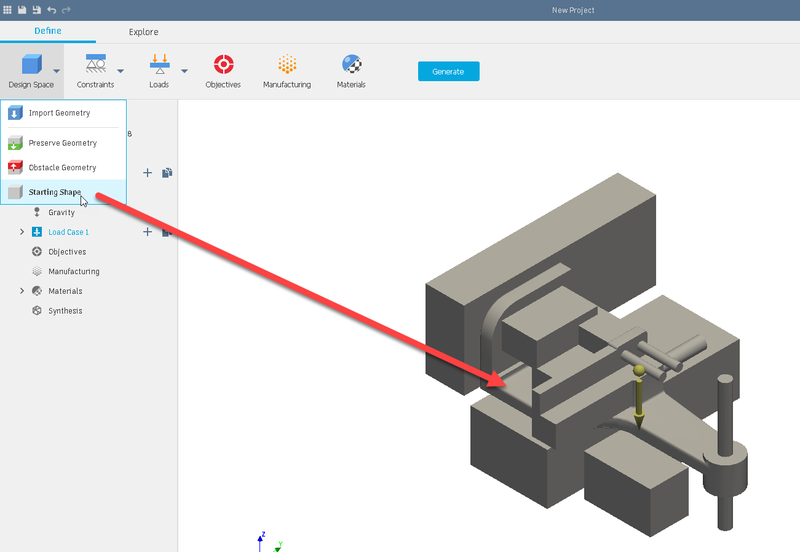 The geometry that’s designated as preserve or obstacle (in Generative Design) must be created as separate entities, bodies, components or solids within Fusion 360 or in any other CAD format that is accepted. 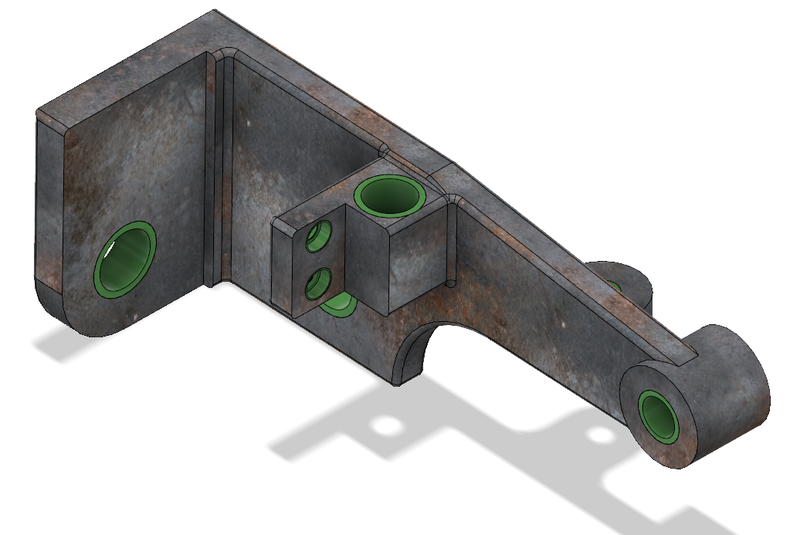 It cannot be part of or joined together with our mounting bracket or your actual component that you may be using. In our mounting bracket we want to preserve these two (2) opened areas to ensure we have an opening in our outcome to run wires/cables through our mounting bracket. 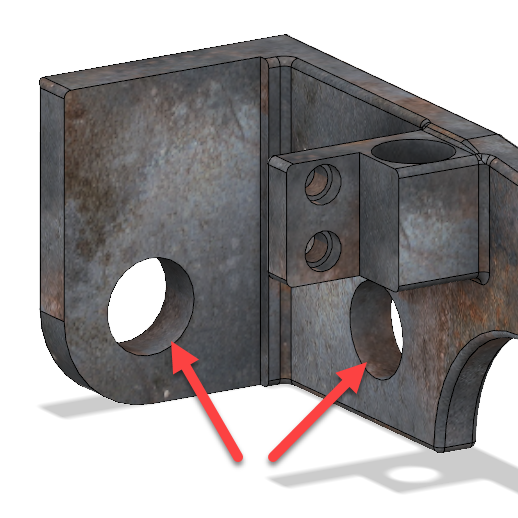 Although these two holes do exist in the starting shape, Generative Design would most likely assume it’s not necessary to have them, thus removing them from the generated outcomes. 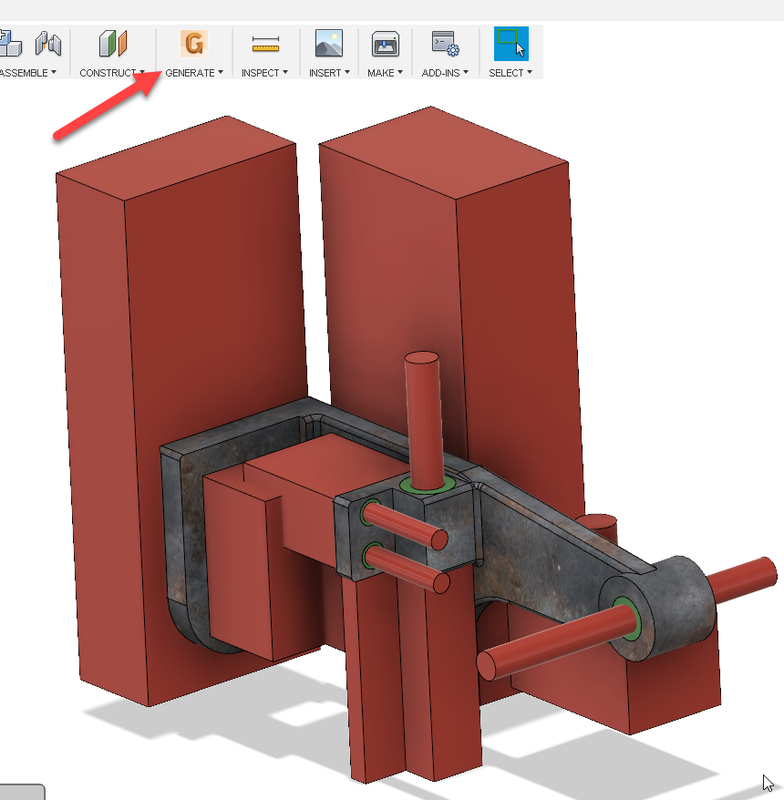 As I stated earlier, we just need to create a separate void in Fusion 360 to maintain that opening. 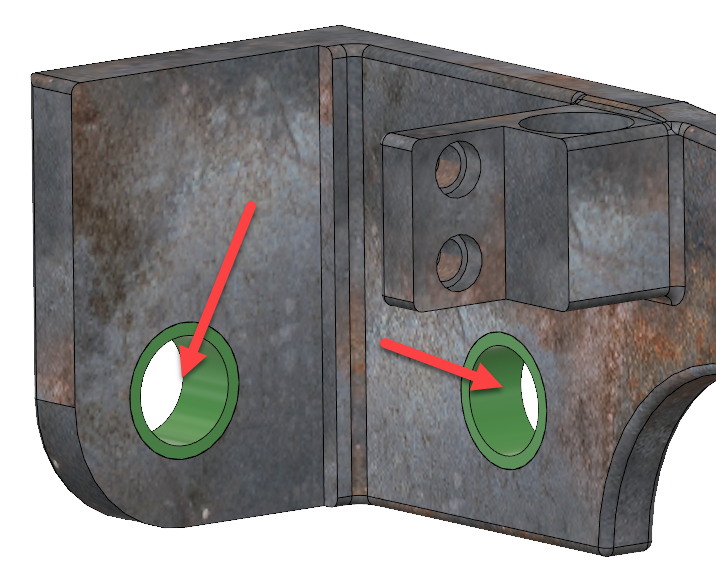 In this image, the red arrow is actually pointing to the OD of the required hole that’s needed in the bracket, even though it’s the ID of the preserve geometry. The red designated items indicate the area that can’t be invaded or the information that’s considered as obstacles (and the outcome must work-around it). 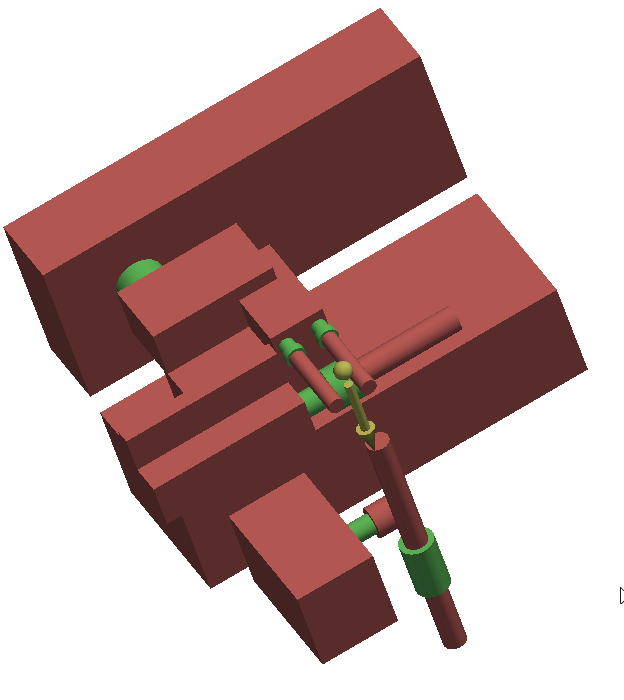 In our design, we need room for cable runs, mounting devices, tools, and existing items within our overall design. As you can see, certain obstacles were created as a simplified format to represent the overall shape of that given obstacle. However, being too simplified could result in not having an optimal outcome. 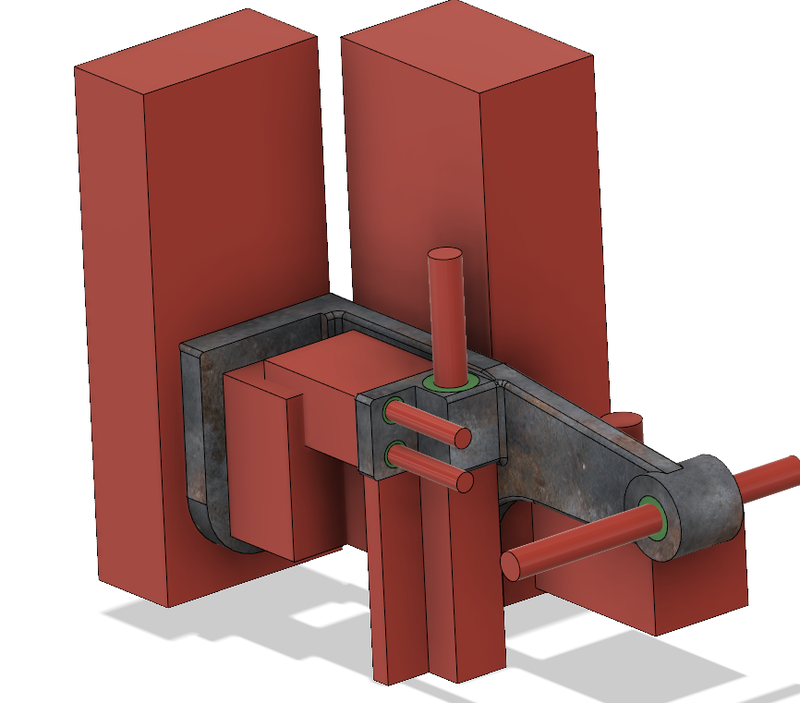 Let’s now save our design within Fusion 360 and select to export it into Generative Design. 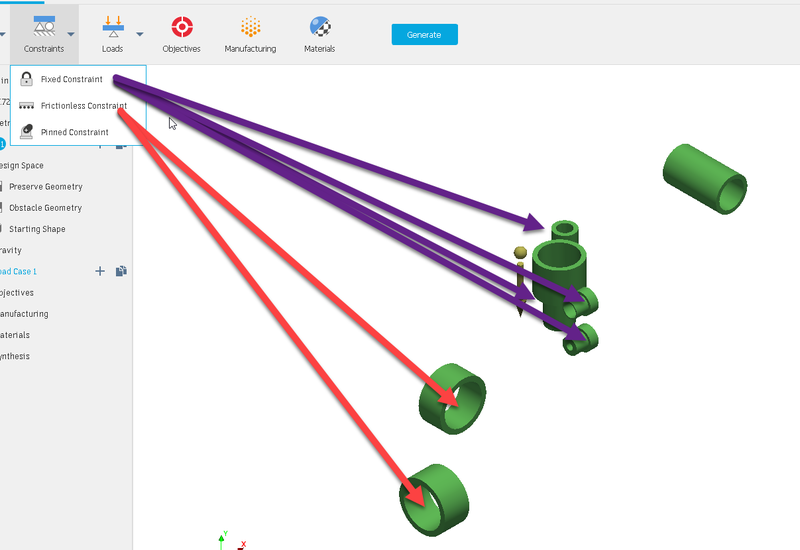 Once Generative Design opens, it will start importing your design. The first prompt is for the units of our imported design. 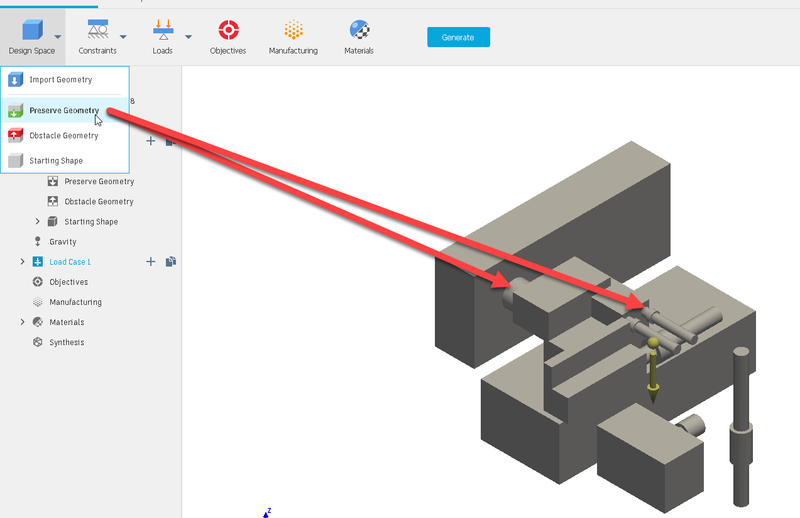 From there, we should see our Fusion 360 information. 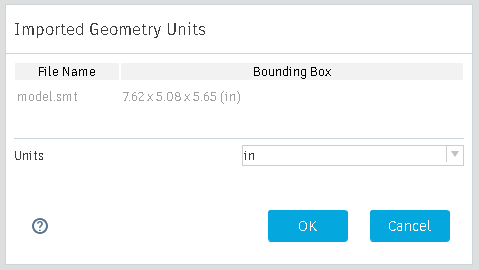 Going forward, it is also assumed your workspace units are properly configured based on the units that’s needed. The interface units can be accessed through the preference section of the application. Although we can start defining our design space (preserve, obstacle, or starting shape) in any order, I recommend starting with the “starting shape” criteria. Wouldn’t you agree, the whole Generative Design criteria is based on this bracket and as-such we should define it first? 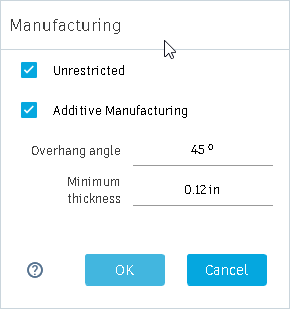 For any of the design space definitions, you do have the ability to turn off its visibility, making it easier to select the other related design space criteria. As you can see, the starting shape information of our mounting bracket has changed color to indicate it’s now defined as that, the starting shape. 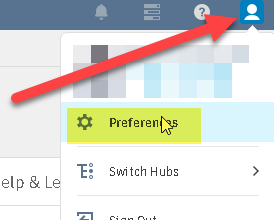 From there, we can expand the “Design Space” within the browser and select the icon to turn the “starting space” visibility off. Now let us assigned the preserve design space criteria, followed by the obstacle information. Hold down the control key in order to make multiple selections. Now before we go too far, the direction of gravity is not orientated properly within my design and must be changed. To do so, go to Preferences/View. At this point, we are ready to start defining our Generative Design study. A study can be based on a single or multiple cases (meaning different loads and constraints). The overall study can also be based on multiple materials and there is no need to define a separate case for each type of material you require. For my load case #1, let’s start defining the constraints and loads associated to it. In this design, I’m defining the fixed/frictionless constraints of the preserve design space (meaning the mounting hardware holes/wire hole) on the surfaces or faces that will host those given constraints. 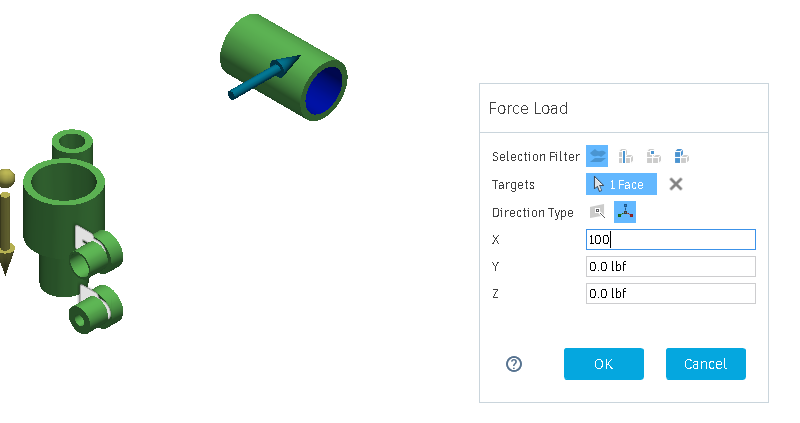 For the load associated to the bearing, I selected a force load and applied the necessary load information to the given face. In this example, the force was applied to the blue surface or the internal surface. At this point, we could create additional studies with different constrains and loads but we’re moving on for this article. For this study, I’m only changing the safety factor to 2 (from a default safety factor of 1) and leaving the manufacturing settings as is. Now, let’s finish up and define the material or materials we want this study to be based on. As indicated earlier, you can define your overall study based on numerous materials (up to 10 different materials may be selected). 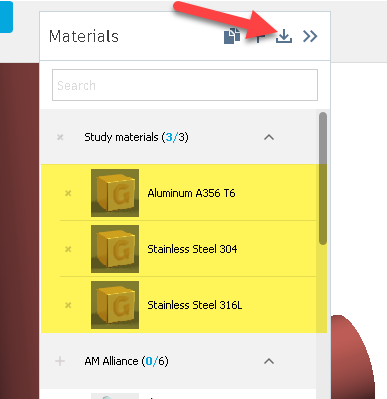 Also, as more materials are added to the interface, you can simply select the download icon (red arrow indicator) to use them within your design. The user is also permitted to develop their own specialized materials they work with and apply those to your study. For this demo, I’m selecting the follow three (3) material types. From here, I’ve turned on the visibility of all design space criteria and selected the “Generate” button from the toolbar. 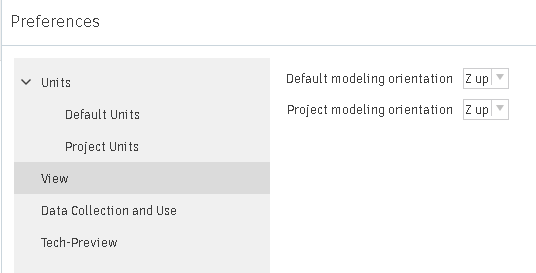 Now I need to define the project name and based on how I’ve signed in, the user name criteria is already determined. Select “save” and if you defined all the necessary information, you should see a ready indicator to proceed with the study. If not, the browser will indicate what information is missing and/or needs to be modified. Once the study is started, in the upper right hand corner of the application you should see the upload indicator notification. At some point, depending on your Internet connection speed, you should start seeing the process happening under the Explore section of the interface. 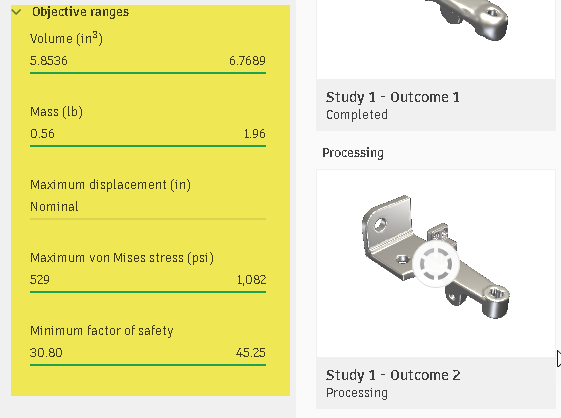 As outcomes are queued and completed, you can start filtering them out (using the objective range information) based on the criteria you’re looking for. You can also select a completed outcome and look at its individual information. Select one of its variation (slider at the bottom) to start determining what study/outcome/variation suits your design needs. Stress information can also be enabled (purple arrow) to see the stresses on the outcome or that given variation. 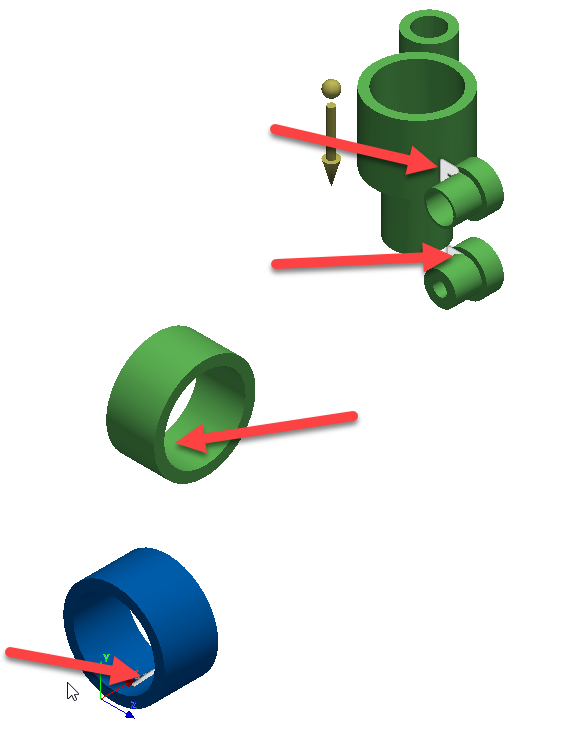 The given outcome/variation can also be exported (green arrow) to a SAT or STL file format. 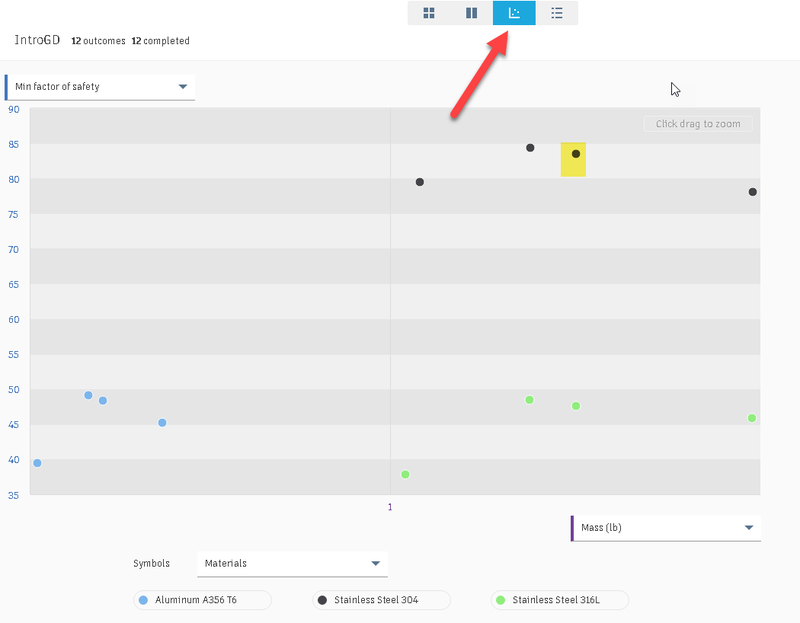 This button (Explore section of the application) gives you a “plotted data type” results based on the materials that you selected for the study. The individual dots can also be selected to view that given outcome and its variations. There you have it, an introduction into Generative Design using Fusion 360 Ultimate. 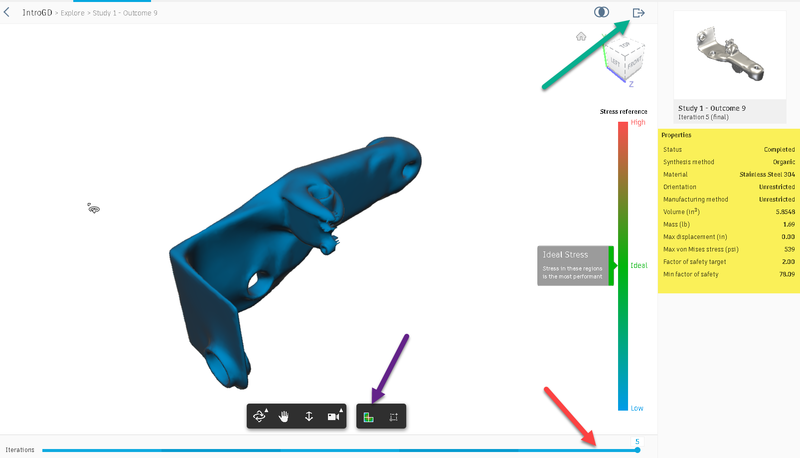 In the end, I hope this article was useful to you in understanding how Generative Design works and the possibilities it can provide to your organization. Want to see more? 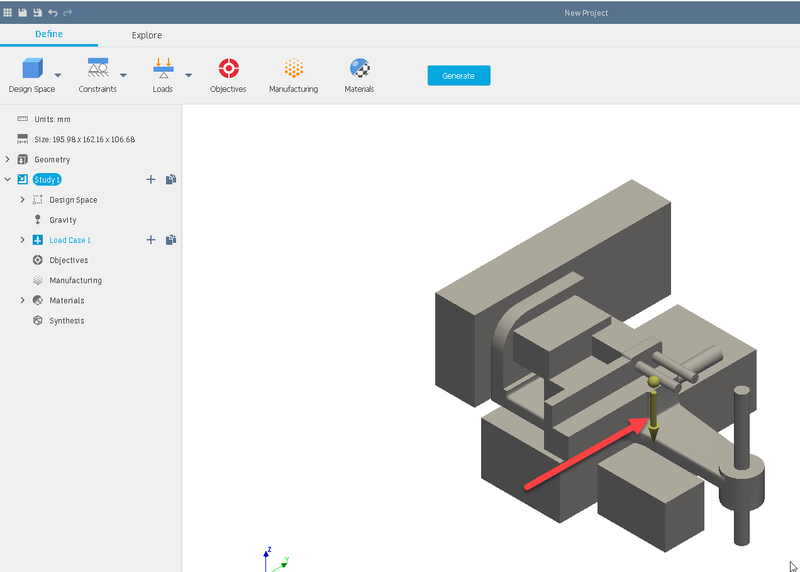 Get an exclusive hands-on look at the technology behind generative design by registering for our Generative Design Workshop with Autodesk on September 25, 2018 from 10AM-4PM at our Synergis headquarters in Quakertown, PA. Exceed your production schedule deadlines by understanding the foundation concepts of defining, generating, and exploring solutions through multiple hands-on exercises.